Fished with Thomas Powell (Loco Pescado Fishing Guide Service) and my neighbor, David Jones. Launched out of Highport about 10 a.m. Headed out to North Island and looked a bit. Fish have been coming into shallow water off the points about that time of day but Friday it wasn't happening. We marked fish in deep water (65 fow). Feet were suspended about 25 - 40 feet deep. We immediately started catching fish. No birds around at that time. Loons were working the area. Birds started coming in and we were almost run over by boats chasing the birds. Pretty humorous as there were no fish under the birds; just loons. We moved out of the area due to all the boat traffic. Geez. Headed over off Washita Flats and found a school in 36 fow. Fish were 25 feet to the bottom. 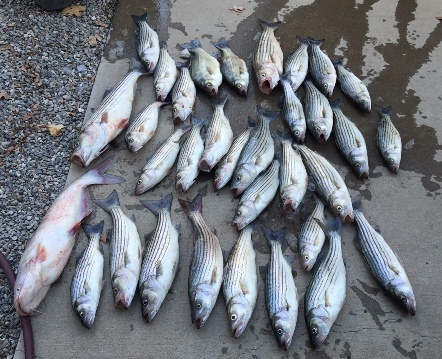 We immediately started catching fish on slabs and plastics. Once again, loons started pushing up bait and we were almost run over. One troller kept circling around out there and not catch fish. I kept thinking: "If you'd stop your trolling, look at your graph, you'd see where the fish are and where they are not". Amazing. That ran us off our spot as the fish moved out with all the boat traffic. Saw several boats almost collide chasing the birds around. I guess most folks don't realize that when you see birds and you approach them.......if ya ain't marking fish ---- there ain't no fish there. We hardly moved from the area for about 2 hours. Only time we puttered around was after folks chasing birds blew threw. Get's to be a little irritating after a while. We fished up and headed in. As an example of bird chasing.....we were headed in along the TX shore line opposite North Island. Spotted a group of about 50 birds along the rocks in 40 fow. We headed over and stopped in about 65 fow to see which way the birds were moving. Two yahoos in two separate boats BLEW in. Pulled right up into the birds, made 3 or 4 casts, did not catch a fish, and BLEW out of there chasing more birds. We sat there. Birds left. One of the largest schools I've seen this year moved right under us. As soon as that 1.5 ounce green/white Ghost Minnow hit about 20 feet, it never went any further. Had a great time. Came in, cleaned fish, and fed the neighborhood with a fish fry. We caught fish on slabs, sassys, and flukes. WTG! I know the pilgrims are ruthless lately grrrr. Great post. Too bad you had to ruin it by posting a photo of a stinking, slimy catfish. Also, sorry about the idiots chasing birds. You just can't fix stupid . Nice haul Joe! Looks like you had a great trip. Good report! Great report and I agree with people blowing through and trolling. 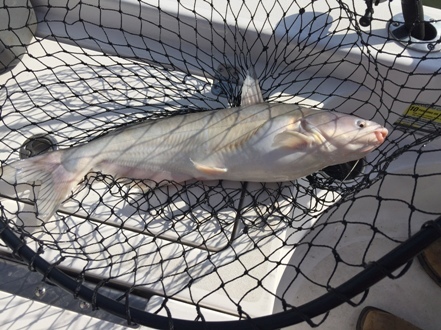 Your right look at the locator or just drift for a little while the fish will show up. If everyone fished like you the lake would be perfect. Some fishermen are like vultures when they see a bent rod.